Firebug is like a baby made of candy. If you don’t get that analogy, no one will blame you but best not to bring it up around the hitching post, water cooler or back of the garbage truck, wherever you take your particular daily break. Suffice to say, this little plugin developed for Firefox is like having a twin brother who will go to school for you, do all of your homework, sit in the waiting room until the doctor is ready to see you and let you take his girlfriend home after he did all of the wining and dining. Write some code in your favorite editor (I like Coda for Mac, FYI). FTP that to your website. Open up the site in your browser, wait for it to load. Wow, it’s all messed up. Repeat steps 2 through 3, over and over again until Comcast calls you and says you’re using too much bandwidth and you find out you’re 93 years old for all the time spent waiting. 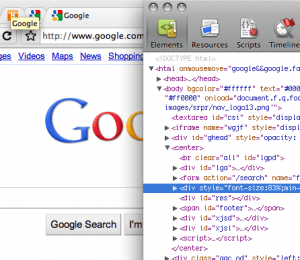 With Firebug, you just right click on an element and can edit the CSS values right there. Figure it all out, go back and make the changes in your editor, and you’re done. Chrome comes with a built in feature similar to this, and it’s a lot like Safari’s Element Inspector. Both of those browsers differ from the Firebug plugin in one major way: they’re not as easy to use. Firebug opens up in a pane at the bottom of the browser window. Chrome’s Inspector opens in a new window of its very own, requiring crafty keyboard shortcuts or mouse clicking to go back and forth between browser and inspector. Weak. That’s my only major complaint there, but it’s one of those little things that itches your knuckles just enough to keep you from wanting to use Chrome full time. In Element Inspector, clic on the bottom-left button and it wll dock/undock, no problem here. My main complaint with Element Inspector is how unnatural the CSS panel feels, very difficult to edit or add new attributes, or edit HTML directy. I agree about the difficulty of using the Inspector as well, in fact, I haven’t figured out how to add new attributes and clicking in the existing attributes or within the HTML pane is a task to say the least. I do like how having the element inspector open in one tab doesn’t mean it’s open across all tabs, though, as it is with Firebug in Firefox.